Ryan Adams can be a lot of fun when he’s not picking awkward fights with The Strokes and Father John Misty. 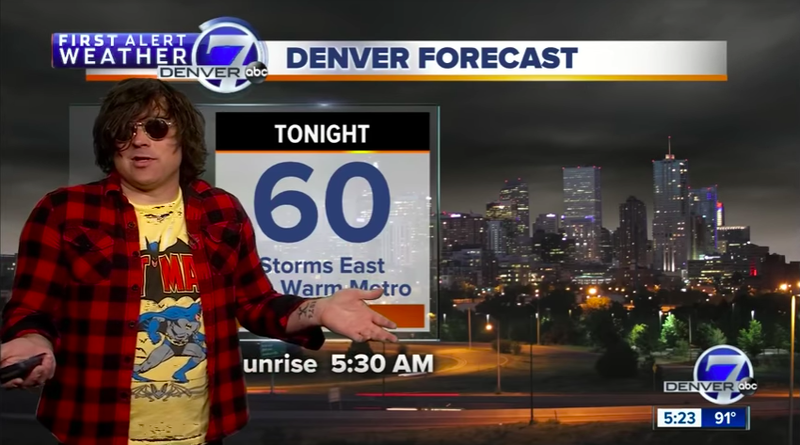 Last night, for example, he hilariously delivered the 5 p.m. weather forecast for local news channel Denver7 in advance of his own concert at Red Rocks Amphitheatre. This was the culmination of Adams’ charming recent efforts to pay tribute to Colorado media outlets. First, there was “105.5 The Colorado Sound,” an ode to the song’s namesake radio station, and then there was “Denver7 (Piece Of Heaven),” which he wrote with news anchor Shannon Ogden. You can hear that one, along with an animated music video made by the station, below. The sultry slow jam makes his burning desire to deliver the weather clear: “Can you let me do the weather one time?” he sings. “I’ll wear my Batman shirt / I’ll wear my flannel.” And that he did. Adams cut a striking figure alongside the buttoned-up anchors, who seem as baffled as they are amused. Adams credits the 1996 movie Twister for his interest in weather before being whisked to a green screen, where he then discusses the city’s forceful winds (“For anybody that’s super into the wind, there you go”) and high temperatures (“95? Sounds a little hot”). “This is exactly as weird as I thought it would be,” he concludes. Watch Adams’ interview and weather report below.